The primary temperature anisotropies of the cosmic microwave background (CMB) have now been mapped by the Planck satellite to near the limits set by cosmic variance and foregrounds. As a result, the future of the field will now shift toward large-scale structure (LSS) surveys and CMB polarization. This new territory presents both a challenge and an opportunity. While data from the Sloan Digital Sky Survey and smallscale CMB experiments like ACTpol and SPTpol have been available for a few years, these experiments have yet to compete with measurements of the CMB temperature in raw sensitivity. Ultimately, new experiments must surpass existing constraints if we are going to address unresolved questions we face today in regards to the physics of the early universe. Existing data supports the framework of inflation at early times, nevertheless, we know very little about the mechanism that leads to an accelerated expansion, either in the past or in our current universe. In addition, motivations from particle physics, and from the observation of late time acceleration, suggest our cosmological history may be more intricate than previously thought. Cosmological observations may be thus our only hope to address these issues. The aim of the school is to familiarize students with both the important theoretical questions left in cosmology and the observations that may shed light on them in the future. The first week will develop the theoretical background, while in the second week future observational probes are discussed. 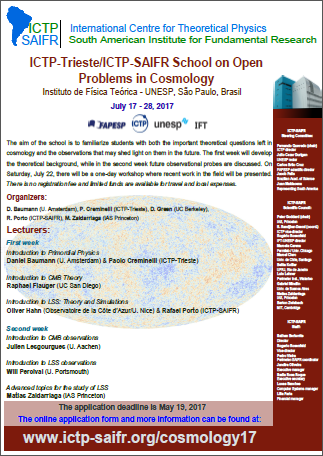 On Saturday, July 22, ICTP-SAIFR will host the workshop on open problems in cosmology. Presentations will provide a review of the newest developments in both theoretical tools, forecasts and observations. The discussion will be oriented towards the problems that are most relevant for further progress. 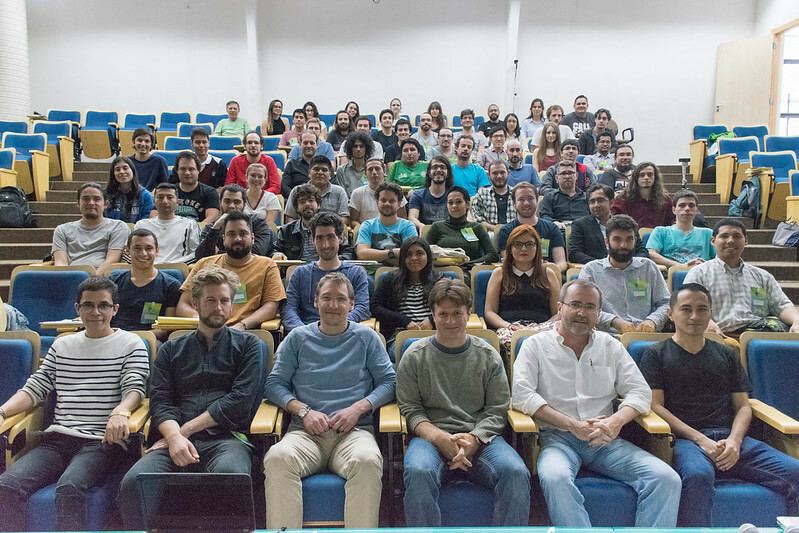 The application for the school automatically includes participation in the one-day workshop. There is no registration fee and limited funds are available for travel and local expenses. We will not try to get into the details of observational and instrumental aspects. This course will stay close to CMB theory, and will discuss concrete consequences of the formalism reviewed by Raphael Flauger. For each Planck bound, we will discuss the effects of the underlying parameters on the CMB spectra. We will follow a graphical approach: we will comment some plots showing not only the variation of the spectra with the parameters, but also of intermediate quantities such as the transfer functions. These lectures will also be a primer to the use of the cosmology codes CLASS and MontePython. We will provide the python scripts used for producing the figures with CLASS, in such a way that the students can learn how to produce similar plots. Finally, we will show how to proceed in order to reproduce the Planck bounds with MontePython. Click on the name of the Lecturers on the table below to download the pdfs and on the tile of the talks to watch the videos.